The donation was made to the James F. Evans Endowed Chair in Ag Comm. The chair's goal is $2 million. Farm Progress Companies recently awarded $25,000 to a University of Illinois initiative between the College of Agricultural, Consumer and Environmental Sciences and the College of Media designed to address the growing need for effective communications in the fast-changing world of agriculture, food, feed, fiber, bio-energy and rural development. The award will be applied towards the university's $2 million goal for the James F. Evans Endowed Chair in Agricultural Communications. 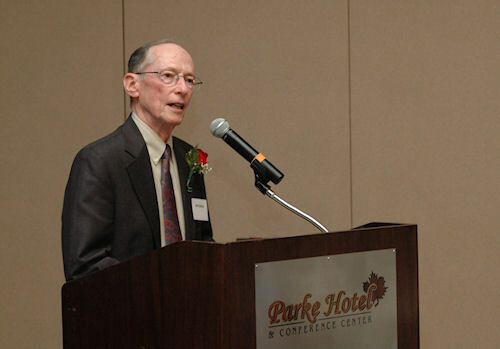 Photo Caption: For his contributions in furthering the field of ag communications, Jim Evans was selected as a honorary Master Farmer in 2010, by Prairie Farmer magazine. "The University of Illinois is a leader in ag communications," explains Farm Progress president Jeff Lapin. "Farm Progress Companies has benefitted from having many graduates of Dr. Evans' program contribute to our success and leadership as an agribusiness media organization. We're delighted to help support an Endowed Chair to provide opportunities for future communicators." The university plans to enhance its joint agricultural communications program with a first-of-its-kind endowed chair in agricultural communications to support teaching and research in the field. At least three teaching positions will be created through the foundation. The program will include initiatives in consumer and environmental communications. "We are grateful for Farm Progress Companies' willingness to support this important initiative that will benefit the university's students in agricultural communications for years to come," adds Robert Hauser, dean of the College of ACES. Jim Evans is a retired professor who pioneered the development of U of I's Ag Communications Program. In 2010, he was named an honorary Master Farmer by Prairie Farmer magazine, Farm Progress' oldest publication, which dates back to 1841. The University of Illinois Agricultural Communications Program is a dual program between the College of Media and College of ACES. In recognition of Jim Evans' many years of exemplary service, the endowed chair is being established in his name. To achieve this goal, $2 million in funds are needed. To make a gift to the fund, visit http://agcomm.aces.illinois.edu/donate. Farm Progress publishes 18 state and regional farm publications nationwide. In addition, the company produces four farm trade shows, including the Farm Progress Show, the nation's largest outdoor farm show.